White Sage Tarot, in a tin, by US Games arrives YEY! I’m so excited, for a little while I’ve been on the look out for a small tarot deck in a tin. 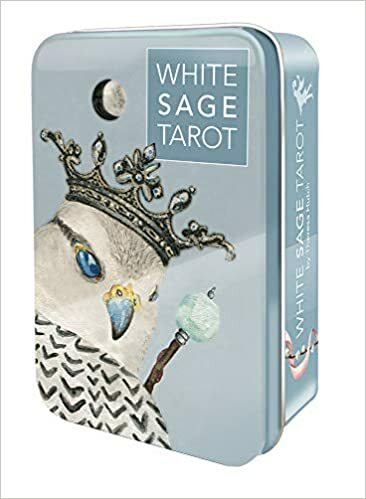 Not being a fan of classic RWS or Marseilles styles nor cats I hadn’t found one I liked UNTIL I saw Hermits Cave video on You Tube featuring White Sage Tarot by Theresa Hutch. The first edition was available through the authors website and was the one Simon was showing but US Games had the rights and were producing a mass market version, pocket size and in a tin. This is a soft pastel coloured deck featuring animals. This is for US Games version of the deck pocket size cards in a tin. Made by US Games so great card stock. The card is thinner than their other decks I have but thicker than the Green Witch Tarot by Llewellyn. Card size 9.5cm x 5.5cm. Boarderless around the top and both sides of the image with a section at the base of the card which is white and has the card title, same styling as the authors original deck. Card backs are grey basket weave effect looks like zentangle basket weave design. I love the illustrated images, from water colour paintings. Each suit has its own animal for the court cards and the animals are posed with crowns and with the suit object so wands, cups, swords, pentacles. Ace to tens are pip images with ribons of chakra colours woven through them. Stunningly beautiful (IMHO). The lettering style is in capitals throughout, grey ink and sans serif so no weird ‘bits’ on the letters that for a dyslexic like me find so hard to read. The tin is wonderful, sturdy and colour matched to the muted pastel tones of the deck. Because these are little the little white book is also little but there is a more detailed version of the LWB available on Theresa Hutch’s website. I am beyond happy with this deck, I love my Spiritsong by Paulina Cassidy but this one is a little stunner, pocket size and in a TIN. Now I just need good light n working hands to hem a fat quarter to make a reading cloth for it (dusts off the sewing machine). Thank you Theresa Hutch for a beautiful deck. Theresa Hutch this is her website, if you order from here you can choose full size 1st edition cards in the cardboard box or US Games version of this deck in pocket sized cards in the metal tin. This is also where you can download the longer version of the LWB. Wordery also had a few, but looks like they sold out, but u can sign up to get an email from them when they have more in. I have a long ‘practiced’ response to threat, which is shock and shut down. Its my default to difficult situations, I wish it wasn’t, it gets me hurt. A whole new world of pain has opened up in my grief, its been 4 years since hubby died, feels like yesterday and forever ago in the same heartbeat. I recently was speaking to someone I haddn’t met before, and fell into a whole new painful trap. When the found out hubby died, the sentance after the shoe shuffle and ‘Oh I’m so sorry’ was ‘When did he pass?’ when I said, the reflex response I received was a shock, BIG TIME. 101 ways to meet new people, get back out there, find someone new. WHY for the love of sanity why does society feel the need to fix and to have ‘deadlines and goals/targets’ for every thing in life. Grief doesn’t come with a clock, it just IS and I’m doing the best I can with the resources I have. I am NOT remotely ready to get back out there, find someone new. My soul mate was not a pair of shoes, that have worn out and needs replacing. First it was once the funeral is over ‘you should’ have bounced back to your old self, or embraced this ‘whole new you and start exploring’. It just doesn’t work like that. I’m not sure where all this back of a fab packet advice on grief comes from, is it from greetings cards? Is it what happened to you and since no one has shown you another way, that’s the line you are going with? Each grief is different, how it happened, what lead up to that moment, what happened during, just after and since. All these things impact on how we react to events. Death is not like on TV, its not always gentle, quiet, or quick. Grief is not like it is on TV, emotions are messy, noisy and loud. I forgive you if you can’t be around me when I have a meltdown, but that IS you and your reaction. It is NOT ok to correct, blame or shame me for how I’m doing, or what I’m doing. I’m not hurting anyone, I’m grieving, and its not pretty. I don’t have the capacity to ward off your advice when it hurts, so I avoid you, just as much as you avoid me. The separation hurts, but not more than hurtful words that I just can’t file as ‘well she means well’ any more. I’ve been hurt too much, too often for too long now and I’m done people pleasing my way through this. Most people have forgotten this has happened, their busy lives were barely touched by this, and other thing fill their time. It is different for me, I don’t understand why they cannot see that, cannot show compassion. What have I most needed in my grief, company, a silent witness, who will be there by my side for a while. Someone I can talk to day or night, who gets me, even though they don’t know what this is like, they don’t try to change it, or fix it, they are just THERE. Talking about grief is needed, every single one of us will experience this, if u have another living anything in your life this will touch you too one day. Like they say ‘Grief is the price we pay for love’. Is this the only thing I want to talk about? No but I’m done trying to find someone to talk to about this, done seeking permission to grieve how I am grieving. I am doing this alone, because there is no other option. I’m doing this alone because when I reach out and am corrected judged and shamed it hurts too much. So I journal, I scribble, I drum, I cry, I hold crystals, and I read books, or have audio books when I can focus to read. I write poems from the depths of my soul that Emily Dickenson would be proud of. Those poems those journals, they are the one place I can express how this feels, what it is like to live this day by day. Everything born will one day die, loss will happen. Can’t we just walk each other home and be there for each other in a kind loving gentle way? If you are trying to support a grieving friend, please read this. If you know someone who is grieving, please follow this link and watch the film with Megan Devine in it. If you are asking yourself the ‘what do I say?’ question, this post is for you. It really, really hurts when you are grieving and need someone to just be there to just listen, if they ASK you how its going, or what you need, it takes so much energy, strength and courage to respond, then they hit you with advice, they try to fix things and it hurts so bad when you are least able to deflect it or ask them to stop. Please follow this link to a piece from a show that Megan Devine was on, for what you *should* say. Yes I have a pet peeve on anything that starts with ‘should or must’ but when you watch you will see why, I am posting this. This was aimed at bereavement but so much of this also is totally relevant to anxiety, depression and mental health issues as well. What I and a lot of others most need, is someone to be there, to listen and as Megan says to ‘witness’ NOT fix. Everyone’s path is theirs, they are doing the best they can with the resources they have in that moment. You may have been through the same situation, but your reactions may not be the same as mine. You may have the same condition as me but our reactions are unique to each of us, because we are unique. Hooray, well if you are reading this we made it to November, and if you need help for the next 30 days, here is it. Over on Writers Digest they do this wonderful challenge in April and November of posting a poetry prompt for every day. For some reason this time of year is my most poetical. And even when I don’t feel able to write, I still enjoy collecting the prompts in a note book for another day. So my fellow stationary junkies lets find our favorite pens and notebooks and gets started. I dedicate this poem to the wonderful people at Writers Challenge for all they do and for this wonderful challenge. A poetry challenge, here I spy. Write some words, and create wonder. Let’s all write, it will be grand. Your challenge, helps me stay alive. As someone who struggles big time in the dark evenings with depression and anxiety. These poetry challenges are a real life line, a reason to get up and check in, to see what the days prompt is. (I’m old school n don’t have a smart phone). I don’t always write a poem every day, but I write the prompts down and let them roll round my head and see what falls out. If nothing, that’s ok, they can stay in the journal for another day. Sorry didn’t mean to make that rhyme. But its nice to have something other than worries rolling around in my head so the PAD challenges are a good idea. As for the punctuation, yeah I do struggle with that, thanks to dyslexia. I go for the write the words out, (brain dump) read it out loud n see what sounds like a gap to breathe, (stick a full stop in or comma, here n there. Hopefully since its not going to be sent in anywhere for marking, its just for making a little while seem softer and for the pleasure of writing, then it will be ok.
Weekly Poetry Prompts, the site also puts up weekly poetry prompts on a Wednesday. Papuro Milano Refillable Handmade Italian Journal. Here they are on Pilotfish, trading as The Online Pen company. Mine is the aubergine one, looks blue on screen but is delicious deep purple in real life. You can buy blank or lined paper for them too. The INKtober official prompt for today was SPELL and as I opened the back door this morning, in the fog I saw something that immediately prompted not just art but a poem too, handy as its also National Poetry Day. I had planned a bit of a mash up today between; Inktober and Poetry day but life had other ideas, the poem got written but sadly the art didn’t get to the page so here is the poem and hopefully the art will get added at a later date. When they are low in light. Hope I can add some art to this page at a later date for the Inktober part. When you need to tell people stuff but can’t. I was just on Twitter and a post came up to a wonderful site called Stickman Communications. I will link below. Wonderful site, if you have a condition that makes it hard for you to communicate at times but is also an invisible conditions the items on this site look brilliant. When you can’t find you word, but need help and want to ask someone something or explain why things take longer check these out. There is so much more to investigate on this site, totally brilliant! Not just about anxiety and depression but other conditions that people can’t see but make communication difficult. Hannah Ensor you are a star on so many levels, thanks for all you do and all you have created. Waves from a fellow Spoonie, I hyperflex too, its a crap superpower unless you loose something down the outside edge of the car seat then having fingers that bend backwards and you can reach it is handy. The rest of the time it flamming hurts. I’m going to be ordering SOOO much from this website! Just a short post today just wanted to share this and remember where this is before I forget! More ways to connect with them. Anyone else struggle with boundaries? Where everyone else dumps their boundaries on you but you struggle to find the words to articulate your own needs and boundaries? I really struggle. I know what I like, what I don’t like, how I do and don’t want to be treated but I’ve spent so long squiching myself into the ‘boxes’ ie boundaries and expectations of others that I haven’t found the words to voice my own. The above was in response to this post There is a lot to read on various things on this blog, I fell down the internet rabit hole and lost an afternoon here. I have no words yet, just sharing things I’ve been reading about.